A wine industry first, this Zero Oxygen Solutions Wine Preserver keeps an opened bottle of wine perfectly preserved for up to two months. It works its magic on any variety of wine – red, white or rose – so you can drink just a glassful and save the rest for later… much later! Every glass will taste as fresh as if the wine has just been opened – perfect if you need a little wine for a recipe midweek, but you don’t want to drink the rest until the weekend. It even lets you reopen and reseal the bottle so you’ll have the freedom to drink as little as you like – no worries, no waste, no reason to drink more than you’re comfortable with and no morning-after recriminations! Designed by wine lovers from the California wine region, it completely eliminates oxygen from an opened bottle of wine, preventing the oxidization that spoils the flavor of your wine. Super-easy to use, there’s no need to inject gas or pump like crazy to create a vacuum – just insert it into the neck of your bottle and leave it standing upright in the fridge or in a corner of your kitchen. The special ZOS cartridge is filled with a specially formulated compound which absorbs 100% of the oxygen in the bottle. Zero oxygen – Zero waste – Zero effort. A built-in computer chip automatically runs a series of checks on the cartridge every time you insert it in to its airtight holder, flashing lights from red to green as it does so. When the light turns solid green it’s ready to pop into the bottle, a green light flashes to let you know it is operating correctly, and a constant red light means it’s time for a new cartridge. One cartridge can preserve up to 15 bottles of wine. It’s incredibly irritating to waste a glassful or two of a lovely wine because you can’t reseal the bottle effectively. The technology behind it has been tried and tested in independent laboratories over a 3-year period, and the final product approved by a host of winemakers and wine experts. How do I know when I need to replace the cartridge? In terms of number of bottles or time, how long does a cartridge last if in constant daily use? 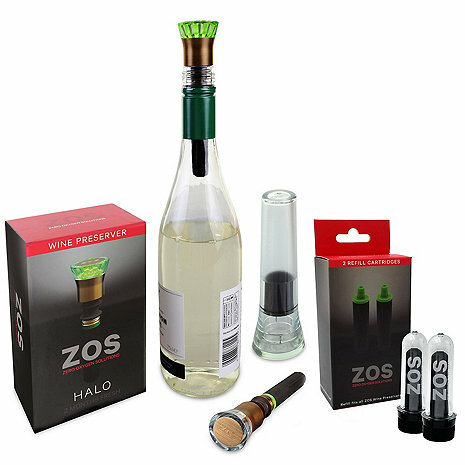 BEST ANSWER: The ZOS Halo Wine Preserver Bonus Pack With Free Oxygen Cartridge 2 Pack cartridges last anywhere from 5 to 15 bottles of wine and can ensure your wine is the same when you return to it for up to 2 months. It is very important to limit the cartridge’s exposure to air, so even laying it on a counter for a few minutes can significantly shorten its life. Always return preserver/cartridge unit to the holder when not in use. I have been using mine for at least 5 months - there is always a bottle of wine on it. I'd say it has had at least 2 dozen bottles on for various lengths of time. Cartridge lasts 7 to 10 days at most. If you are finishing a bottle every other day you really don't need this. What to do when we run out of O2 cartridges? BEST ANSWER: The cartridges are available in packs of two and can be purchased on line from Wine Enthusiast or other on line outlets. I also purchased through Kickstarter and experienced some quirks with the original units. I perhaps expected some initial hiccups in a start up campaign. I love the concept and my replacement units seem to be preserving just like I hoped. Very happy with this product now! Unanswered questions for customer service. First cartridge lasted only six days in the bottle. Second cartridge turned blue, not green in the bottle. Why? First use, stored according to instructions, it’s flashing red. Needs new cartridge?? Sorry, this is useless.